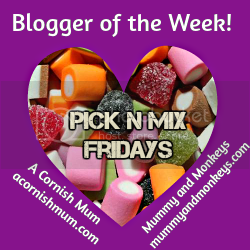 A few weeks ago, I had an email from the lovely people at Riverford asking if I would like to try out one of their new recipe boxes for free! Obviously I said yes because I love food. I like veg box schemes, so was interested to try a Recipe Box. They are made for people who are too busy to sit down and plan menus/go shopping for ingredients, so that they can still be able to enjoy cooking and eating good food with fresh ingredients. I chose the 'quick' option because half an hour is about all the time I have for cooking in the evenings. When it arrived I was very excited. The box was really nicely laid out, with three small sections for each meal. The chilled ingredients were kept cool in an insulated bag. 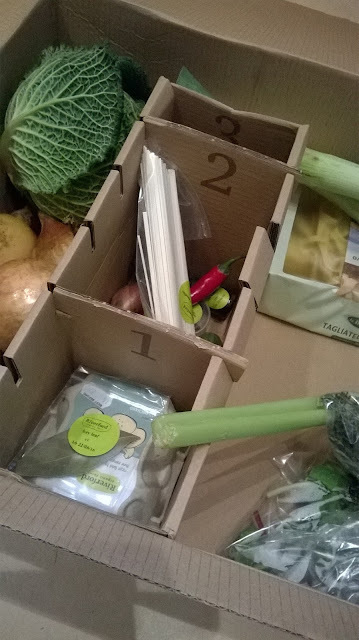 The box also came with an introduction-to-Riverford booklet with an a-z guide to vegetables, and three recipe cards. 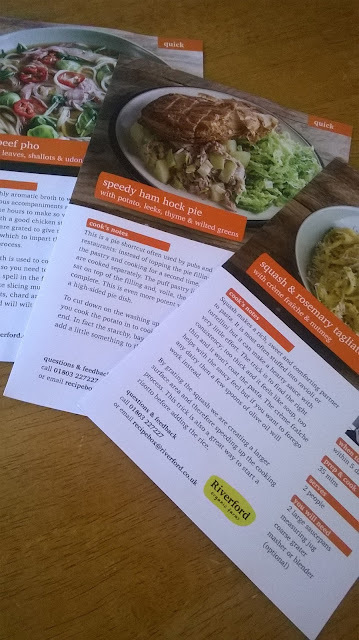 The recipes in my box were a speedy ham hock pie, squash and rosemary tagliatelle with creme fraiche and nutmeg, and beef pho with sprout leaves, shallots and udon noodles. I have to give props to the people organising the boxes and writing the recipes - the ingredients are seasonal and fresh, and worked together (i.e using half the tub of creme fraiche for the pie and the other half for the pasta dish). The recipes themselves work, with very clear instructions, and the timings were perfect. And they were so good. The squash-and-rosemary tagliatelle was the least exciting to us personally because it is the kind of thing I might cook anyway, but was still delicious. The speedy ham hock pie was quick and easy to assemble, filling, and looked really lovely on the plate. The beef pho was full of flavour (and made me crave noodle soup a lot since we ate it). The ingredients were organic and of a very high quality, especially the beef, which was about a million miles away from chewy-hard-to-eat supermarket beef like we would normally buy plus the portion sizes were generous. 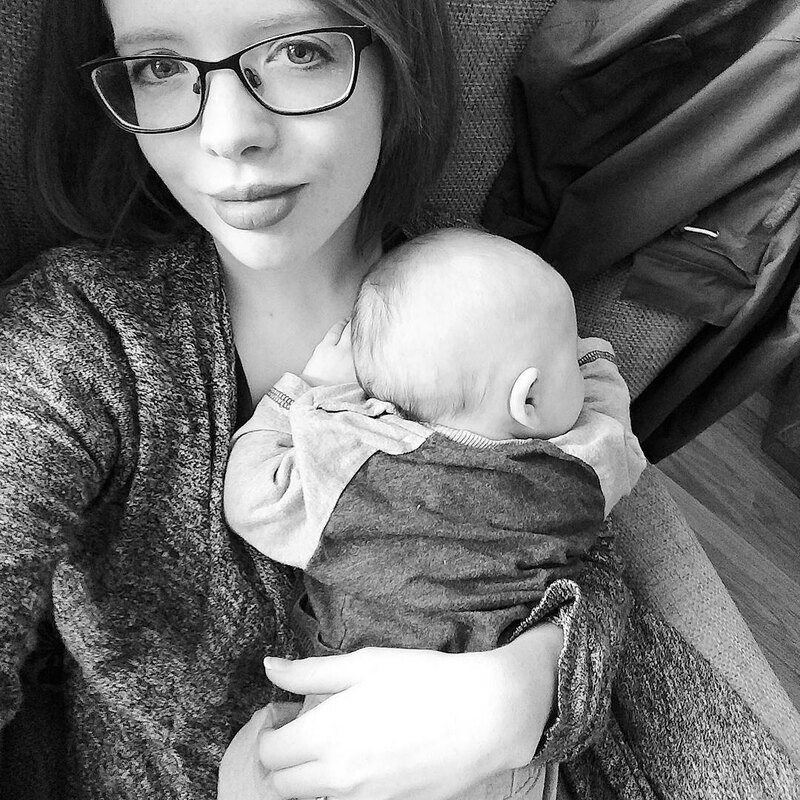 They are sold as boxes for two people, but they easily fed us and our two-year-old. I learnt some tricks from these boxes, too - like grating veg instead of chopping so it cooks quicker, and cooking the puff pastry lid of a pie separately while you cook the filling and then assembling it all at the end - so I could imagine over time we would probably become better cooks by using the boxes. I do contest slightly that any recipe involving preparing a whole butternut squash is 'easy' but then again I have a thing against chopping up squashes (because with our knives cutting up a squash feels a bit like trying to saw into a brick). 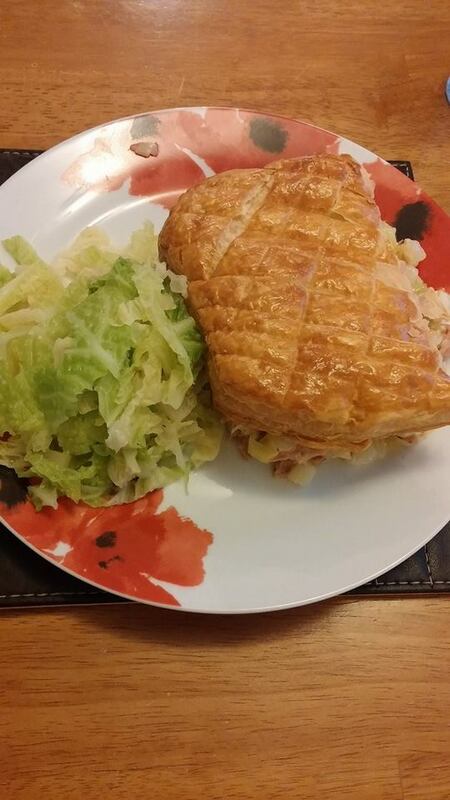 A very very tasty pie. A downside for me is the price. I understand the ingredients are of a very high standard and you are paying for the convenience of having the meals planned and delivered to you, but the quick recipe box is £39.95 - and that includes three dinners for two adults. For us, this would be out of our normal price range (by quite a bit!). The vegetarian option is a bit cheaper, but I feel these boxes are definitely more suited for people who can afford to spend a bit more on their food. 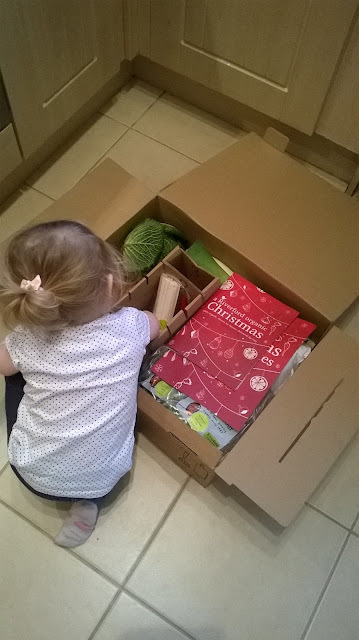 I would quite like to see a 'budget' version of a box like this released, for families who could do with the convenience and time-saving aspect, but can't quite afford the more expensive ones. I'm unsure how this would work, because with companies like Riverford you are paying for the quality of the ingredients, but I would still love to see a lower-priced version. 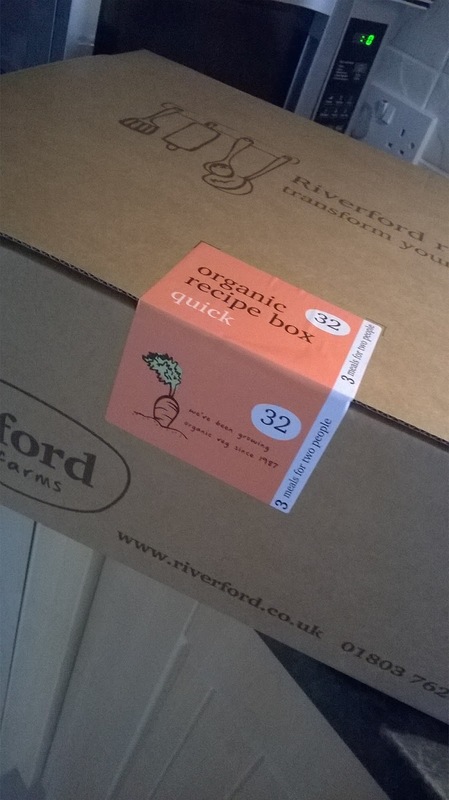 I was really pleased with our experience with Riverford. They have been really friendly and helpful and seem like a very ethical company to buy from. If at some point in the future we decide to start getting a fruit and vegetable box delivered again, I think I will try theirs. They provide a variety of different boxes - just veg or fruit, or a mixture of both, salad boxes, meat boxes, boxes of veg for juicing, as well as their new recipe boxes. So if you are thinking of starting up a New Year, healthy-organic-eating thing, I definitely recommend them. 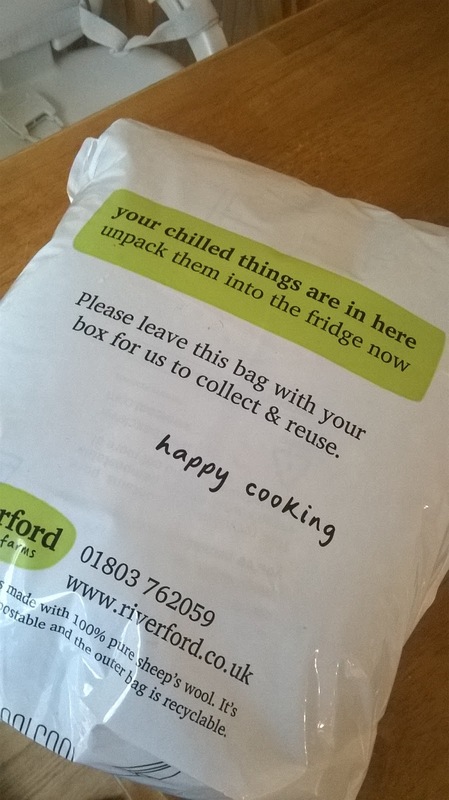 Thank you Riverford for the lovely box and the very tasty meals!